Desert Haveli resort and camp is one of the best hotels in Jodhpur with amazing heritage style architecture, calm and soothing ambiance plus lush green beauty all around the resort. The chirping of birds will be the only noise you will hear at this place. This is one of the finest place providing exciting Jodhpur hotel packages. This is one of the perfect place to spend your leisure holidays with rural surroundings and traditional hospitality services with all the possible modern amenities for your utmost comfortable stay at Desert Haveli resort and camp, Jodhpur. We provide one of the finest and exciting group packages Jodhpur as well as family packages Jodhpur, and among them the most popular one is 2 nights-3 days package. Here you can revive the rich and vibrant colors of Rajasthan’s royal culture, heritage, customs and traditions. In this 2 nights-3 days package, one night you will be spending at the resort rooms and another night you will be enjoying at the camp site area. In resort you will be staying in air conditioned rooms decorated with ethnic infrastructure and interior while at camp site you will be staying in swiss cottages in sand dunes. There is a pool area and garden restaurant in resort area which you can use during your stay at the resort. You can enjoy the hot sipping cup of tea or coffee in this cold winter evenings while your kids play around in the garden area. It will be the amazing feeling to see your kids playing around you while you are relaxing with your loved ones. 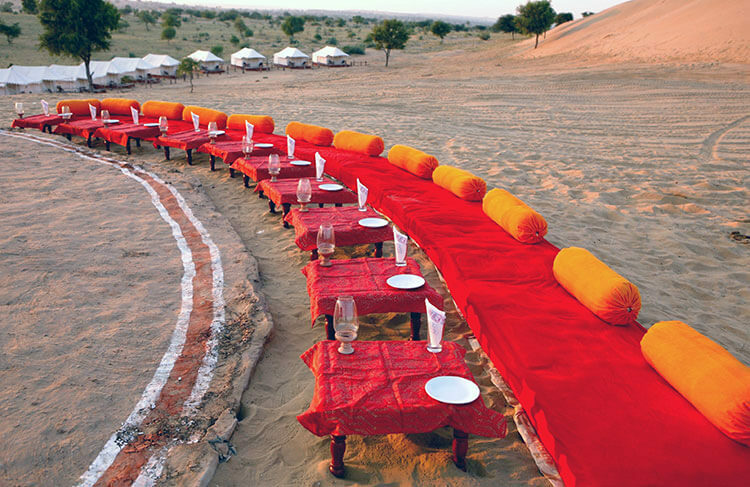 While at camp site you can enjoy walking in sand dunes and you can also indulged into some of the adventurous activities like camel safari Jodhpur, jeep safari in near by village, visit to horse stud farm, visit to the very famous khichan safari and many more things to do during your day time. At night you can enjoy the bonfire with traditional Rajasthani cuisine prepared by our expert chefs with farm fresh ingredients. In resort you have two different type of accomodation options, deluxe ac rooms and royal ac suites. Here you can also get sight of many birds in the nature’s arms. This property is a heaven of tranquility and peace in the surrounding nature. It is indeed the perfect gateway to your holidays and one of the best resorts in Jodhpur. In short if you want to spend your vacation days in leisure style, want to enjoy the traditional hospitality services and if you are fond of heritage properties and culture, Desert Haveli resort and camp is the best place to choose for your next vacation trip to Jodhpur, Rajasthan. You will be definitely having an amazing time with your loved ones and a bucket full of memories to cherish for your whole life.